Tennessee Titans 2010 NFL Schedule & NFL Predictions: The Tennessee Titans need to start the 2010 NFL schedule fast and fast is the buzz word in Tennessee as we get ready to kickoff the 2010 NFL predictions season. Fast as in Chris Johnson fast. Fast as in avoiding a 0-6 start that doomed their NFL picks season in 2009. Fast as in Vince Young’s feet, in and out of the pocket. The Tennessee Titans might be as talented as any team in the AFC, but their 13-1 preseason NFL odds to represent the AFC at Dallas in the 2010 Super Bowl reflect their up-and-down season in 2009 and deficiencies at some key positions. 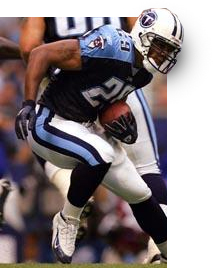 The Titans start with Chris Johnson, their all-world running back whose speed makes defenders buckle their knees and turn their ankles. Johnson rushed for 2,006 yards and scored 14 TDs in 2009. In one game against the Houston Texans he accumulated 284 total yards from scrimmage, the most in the NFL in over 40 years. How can Johnson follow-up his break-out campaign? He must, somehow. Vince Young returned from football purgatory last season to lead the team to an 8-2 record in his starts, with 10 TD passes, and nearly 2,000 yards passing. He will need to mature and stay healthy in 2010. Young has little help for the 2010 NFL schedule in the receiving corps led by Nate Washington and Kenny Britt. Britt could be a player on the rise. On defense, they need a rebound from a secondary that was ranked near the bottom of the league, and more players from a mostly unknown set of linebackers need to step-up and make some plays. In their first four games the Titans play the Raiders, Steelers, and Broncos at home so they need to start fast . . . or their 2010 season will crumble slowly. Bet the Titans to win Super Bowl XLV. The Vegas odds makers at BetUs.com are currently offering players a FREE $250 in their Vegas style sportsbook.